FlexiRoll can enable fast setup for many rental or permanent LED screen requirements. The FlexiRoll HSA Series delivers flexibility for many staging requirements for large format screens making them ideal for band stage backdrops. The FlexiRoll dispels the thought that LED screens are heavy and bulky. With the Flexible range of solutions from ICE LED there is an indoor or outdoor solution for many different requirements. The FlexiRoll format LED screen is ideal in many situation where lightweight is crucial. The LED screen panels are semi transparent that might make them ideal for your situation. If a solid non transparent look is required then simply hang a rear black cloth will achieve this. The FlexiRoll HSA Series is a tidy compact solution that allows easy attachment and installation to a mounting top bar. As seen in the following photo the power supply and receiver signal processor sits with in the top enclosure box. The FlexiRoll HSA Series is available in 20mm, 31.25mm, 37.5mm, 37.50mm Pitch Resolution. The maximum height length recommendation is 4m. One notable advantage of this solution is you can keep adding identical panels to your first purchase to increase your screen size. Or split the quantity to multiple screens. We look forward to hearing from you if you think the ICE FlexiRoll HSA Series can make you stand out on a big screen. The FlexiRoll is one of many innovative solutions form ICE LED. When enquiring about a solution and price please indicate as much detail as you have and how the screens will be used so we can best advise you. Urgent Request to meet a deadline. We do not provide your contact details to any other party. We will only use this information to communicate with you. We abide by good practice privacy policies and non spam type behaviour. The ICE FlexiRoll transparent LED screen comes in a range of formats. Starting at 16mm pitch it delivers the ability to display graphics and videos in a large scale format, but without the large weight and bulk often attributed to LED screens. The flexible nature is a real bonus when it comes to installations due to the substantially less weight in the semi transparent screen. This photo is of the Flexible LED 20mm pitch that delivers recognisable images even at relatively close up. Ideally the resolved MVD is starting at 20mm pitch when the image becomes non pixelated to the viewer. the areas of the screen that are white is what would be black on a graphic and therefore the SMD LED are not lit. In the next photo of the FlexiRoll screen, we have zoomed in real close and you can see in this option the Double Strip model where two vertical rows of LED are present and the transparent nature between the strips. The real advantages can be also considered in the light weight. For a screen that measures just on 10m wide and 2m high the next weight is approx 165kg. An equivalent metal cabinet LED screen could at least weigh in at 600 kg excluding all the infrastructure to keep it up right. because the screen of this size using the ICE FlexiRioll also means the sectional panels are easily carried by one person as they are only 9kg. This carry on benefit means that install costs become a lot less and and easier to implement. If you would like to discuss in detail about any comments or solutions referred to in this video then we invite you to pick up the phone and give us a call or send an email. 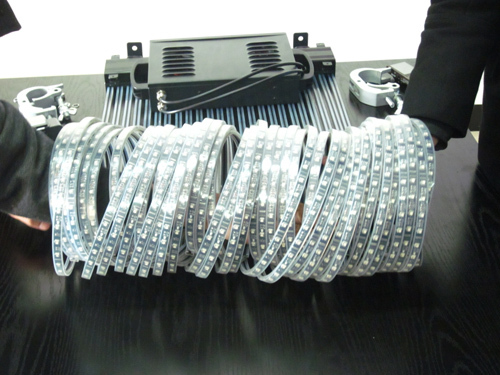 Fold and Roll up your LED screen Just like a Curtain or Mat! ICE AV’s LED Division is gaining a world wide reputation for delivering innovative products and also solutions for unusual and in recent cases enormously large LED screens. The ICE Flexible LED screen known as the Hang-Roll-Fold is a revolutionary concept in large screen digital format display technology. In this video we talk about the connectivity and give you a close up view of a 960mm x 1920mm panel. 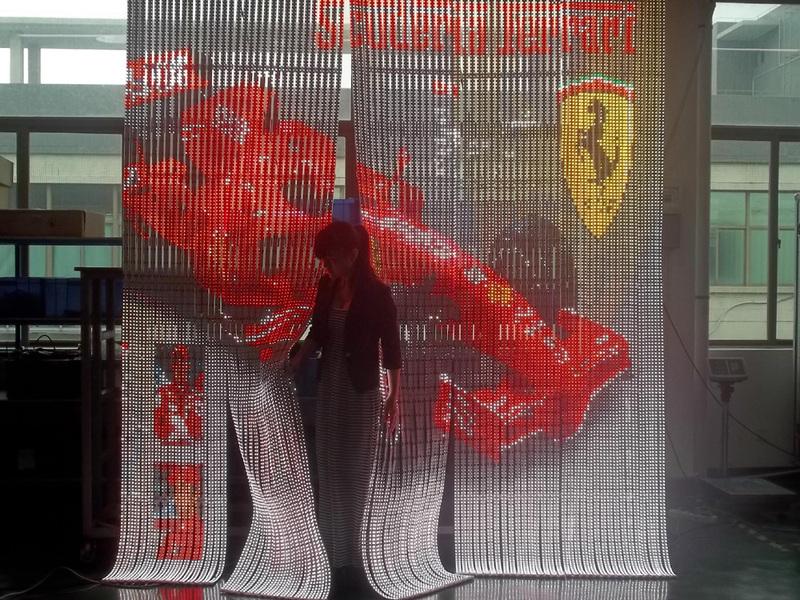 As the ICE Flexible LED curtain screens are flexible and can be folded and rolled they are easily transported, do not require a truck and simply hung from lighting bars, irrespective of the screen size. The ICE Flexible LED can be manufactured in custom sizes and have the increased flexibility of being able to be joined together if specified at the time of manufacture. The screens can even be walked on rolled, folded whilst being operated. Towards the end of the video we demonstrate how multiple screens can be connected to make one single larger screen displaying either one single image of multiple images. The Flexible LED screens range from 18.5mm Pitch to 100mm pitch. This video displays the 20mm Pitch and is suited for video from camera feeds, television, DVD and other sources. Sources can either be a standalone computer or althernatively multiple AV sources are displayed via the Screen input switcher processor. The applications are numerous including public venue events, temporary setups, concerts, sports and entertainment, club parties, movie evenings. ICE AV welcomes inquiries from clients world wide. LED Division: Soft Flexible screens are providing designers and integrators many exciting options to achieve large format digital images. One of the major advantages is the weight factor and when combined with the panel modular aspect. The Roll – Fold – Hang model is a solid flexible LED screen available in a variety of Pitch. The screen can be rolled up and then folded allowing ideal pack and shipping benefits. In this picture is a 20mm 960mm x 1920mm panel that can be easily joined to unlimited widths. Panels are manufactured according to certain size modules that varies according to the Pitch. This model is non transparent whereas the other models we have are transparent between the vertical strips. (FlexiRoll) This feature provides additional features or can be made “solid” by using a backing curtain. The complete range of Flexible LED screens can be controlled form Laptop,s Desktop PC or external Switcher. Pictured below is one option that allows multiple computers, DVD, camera feed etc to be displayed on a ICE Flexible LED screen. This is ideal when you need the flexible to display a variety of sources at the press of a front panel button. many people are a little confused on how a LED screen receives it signal as a LED screen as such does not have a VGA, DVI, HDMI input connector. The signal source is transmitted typically on a Cat5 type cable on a RJ45 connector. the signal format is determined one step back as can be seen on this connections chart. For our clients we take the mystery out of how to make it all work and calibrated. This can be achieved onsite and even remotely. NEW PRODUCT: The New Flexible LED curtain screens from ICE AV continue to advance the use of LED as a innovative screen technology. Most users are only familiar with LED screens in metal cabinets that might sit astride a building wall as a digital sign or in a stadium. The latest addition to the LED flexibles screen range from ICE AV Corp. is the ICE Flexit Strip LED Screen. In this image shot is a ICE Flexit Strip LED screen in action during testing prior to shipping to a client. This is a rear view of the new Double Strip Flexible Curtain screen. Since it is lightweight it becomes cheaper to ship and install. Depending on the overall screen height it is possible to combine a top and bottom row and join the horizontal edge of the two screen rows to create a seamless join in the middle. A close up of the double strip flexible LED screen is the next generation in flexible screen developments. In the above picture, on the new Flexit Double Strip Flexible Screen you can see through into the background between each strip. Customers can also have a cloth hanging backdrop to cover this gap and achieve a higher contrast appearance. Circuit board strips pictured are white or black depending on customers preference. The screens are available in indoor or outdoor versions making them suitable for inside shopping malls or outside hanging on a wall. – Designed to display video and graphics. – Resolution starts at 16mm Pitch. The Flexit Double Strip Flexible LED screen is available from is available world wide from ICE AV Corp., LED Screen Division.